There are 32 Assisted Living Facilities in the Lisle area, with 2 in Lisle and 30 nearby. The average cost of assisted living in Lisle is $4,325 per month. This is higher than the national median of $3,346. To help you with your search, browse the 318 reviews below for assisted living facilities in Lisle. On average, consumers rate assisted living in Lisle 4.2 out of 5 stars. Better rated regions include Westmont with an average rating of 4.5 out of 5 stars. Caring.com has helped thousands of families find high-quality senior care. To speak with one of our Family Advisors about assisted living options and costs in Lisle, call (855) 863-8283. Thanks to its sprawling parks and nature paths, Lisle, Illinois, seems like an oasis of greenery in the heart of the Chicago area. It boasts a bustling downtown area and has numerous annual events, including a garden walk and a hot air balloon festival. The town is home to about 23,440 people, 11 percent of whom are age 65 or older. Two assisted living facilities are located in the town itself, and people who want to stay in the area can choose from 34 additional ones in nearby communities. These facilities are regulated by the Illinois Department of Public Health's Assisted Living Division. Lisle is a very safe place to live, with crime rates that are significantly lower than both the Illinois and U.S. averages. On a scale of 1 to 100, with 1 being the safest, Lisle ranks 21.8 for property crime. The U.S. average is 31.1. Violent crime rates are even lower, with Lisle scoring 20.6 compared to the national average of 38.1. The weather in Lisle can be harsh, particularly during the winter months. Winter highs average between 31 and 35 degrees, and the town gets about 28 inches of snow a year. Summer days can also be hot, with highs in the mid or upper 80s, which can be dangerously hot when combined with the humidity. The town of Lisle has designated official warming and cooling centers to help residents stay safe. Although the overall cost of living is significantly above the national average, most of that is due to high housing costs. Groceries, health care and utilities are all slightly below the U.S. average. Like the rest of the Chicago area, Lisle has excellent public transportation to help seniors get around if they no longer drive. The Metra commuter rail line connects Lisle with numerous other suburbs and downtown Chicago, and the Pace bus system offers shorter local routes throughout Lisle and the surrounding towns. Both have discounted rates for seniors. The Lisle area is home to world-class medical facilities, including Advocate Good Samaritan Hospital in Downers Grove, Edward Hospital in Naperville and Central DuPage Hospital in Winfield, in the event of medical emergencies or illness. Lisle is home to a variety of senior-friendly activities and cultural events, including the French Market, an open-air market held every Saturday during summer months, and the Morton Arboretum, which features interactive nature exhibits and hosts entertainment events. Residents can also visit Chicago to see world-class museums and entertainment, including the Field Museum of Natural History, the Art Institute of Chicago and the Chicago Symphony Orchestra. Assisted Living costs in Lisle start around $4,325 per month on average, while the nationwide average cost of assisted living is $4,000 per month, according to the latest figures from Genworth’s Cost of Care Survey. It’s important to note that assisted living rates in Lisle and the surrounding suburbs can vary widely based on factors such as location, the level of care needed, apartment size and the types of amenities offered at each community. 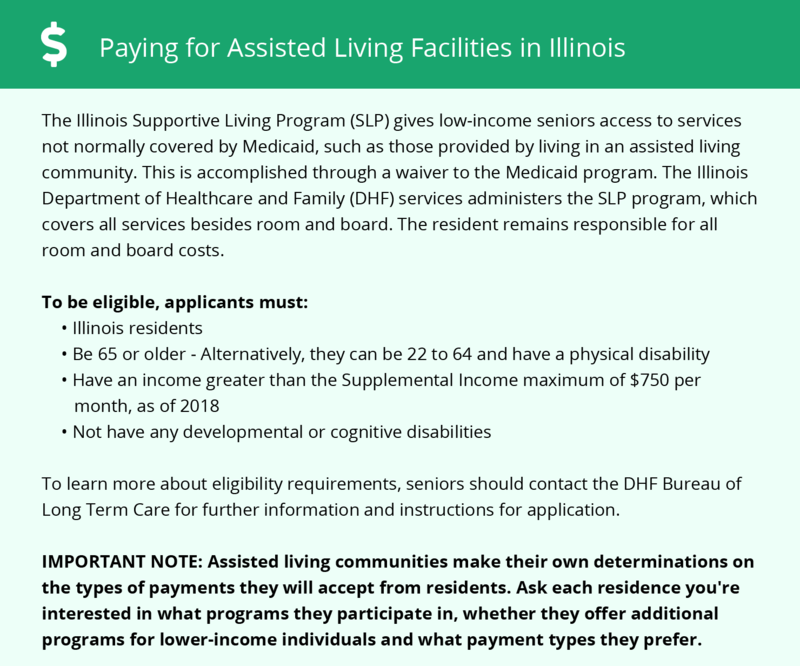 Seniors who need help with assisted living expenses may qualify for the Illinois Supportive Living Program, which provides Medicaid waivers to help pay for daily care and services. Lisle and the surrounding area are home to numerous government agencies and non-profit organizations offering help for seniors searching for or currently residing in an assisted living community. These organizations can also provide assistance in a number of other eldercare services such as geriatric care management, elder law advice, estate planning, finding home care and health and wellness programs. To see a list of free assisted living resources in Lisle, please visit our Assisted Living in Illinois page. Lisle-area assisted living communities must adhere to the comprehensive set of state laws and regulations that all assisted living communities in Illinois are required to follow. Visit our Assisted Living in Illinois page for more information about these laws.